Help No Paved Road To Freedom become a best seller! Provide a review on Amazon.com and BarnesandNoble.com. Talk about it on social media sites such as Facebook and Twitter. 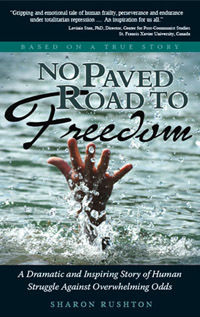 Include the link to nopavedroadtofreedom.com and you’re welcome to upload the picture of the cover to your sites. Recommend it to book clubs and other groups. Author, Sharon Rushton and subject of the book, Cornel Dolana are available to talk to groups via phone. Send a request through the contact page. Recommend No Paved Road To Freedom to online bookclubs (i.e. Oprah’s Book Club) and blogs. Contact local media and ask them to review the book. Let them know Sharon and Cornel are available for interviews. Make us aware of speaking opportunities. Use the contact form and let us know how you’re helping.